The International Trade Centre (ITC), the United Nations Conference on Trade and Development (UNCTAD) and the World Trade Organization (WTO) unveiled an innovative tool to help businesses, in particular smaller firms, benefit from trade. Accessible through a new online hub – HelpMeTrade.org – the Global Trade Helpdesk will serve as a one-stop shop for businesses and policymakers to access trade data and practical information on target markets. For companies looking at potential export markets, the Helpdesk, which is still in a beta version, provides data on applicable tariffs and taxes; relevant health and safety standards and compliance procedures; details about export and import procedures such as pre-shipment formalities; and current trade patterns and trade agreements. Data will be added to the Helpdesk over a three-year period, and complemented with business information such as buyer and seller contacts as well as trade fair dates and locations. By making trade and market information freely available and accessible through a user-friendly interface, the Global Trade Helpdesk will make it easier for companies across the world – especially micro, small and medium-sized enterprises (MSMEs) – to increase their participation in regional and international value chains and help them reduce trade costs. It will assist policymakers make better-informed decisions on trade and investment policies, and enable trade and investment support institutions improve support to their MSME clients. The initiative is not only about disseminating information but also about collecting it. National administrations and technical institutions in developing and least-developed countries will be offered tailored support to overcome capacity constraints in sourcing and updating trade information, as well as to develop country or region-specific interfaces linked to the HelpMeTrade.org portal. This will help empower local stakeholders to publish relevant information in line with their commitments under the WTO Trade Facilitation Agreement and simultaneously update the Global Trade Helpdesk. Business surveys of more than 20,000 enterprises conducted by ITC in 38 developing countries have revealed that a lack of transparency is one of the biggest obstacles faced by business – and especially MSMEs. 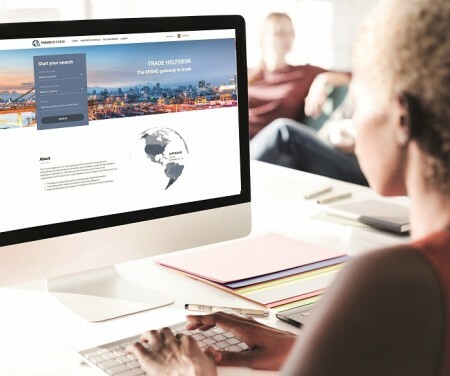 Many small businesses may lack the resources and skills to conduct trade-related analysis, and the Global Trade Helpdesk will be an invaluable tool to access information free of charge. For example, the Helpdesk’s email-alert system will allow users to receive customized real-time information on markets and products relevant to their sector. In addition to drawing on data from ITC, UNCTAD and WTO, the Global Trade Helpdesk pulls in resources from a number of international organizations and development banks, including the Inter-American Development Bank (IDB), the United Nations Industrial Development Organization (UNIDO) and the World Bank Group. The HelpMeTrade.org portal is scheduled to be fully functional in 2020.